Comforting, a little spicy, and even good for you! 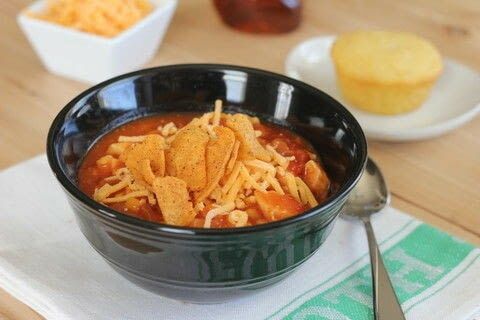 A spicy and comforting bowl of chili that tastes like chicken enchiladas! In a large pan brown chicken and onions together, until chicken is no longer pink. Add in frozen corn. Stir and cook for 2 minutes. Pour in tomatoes, enchilada sauce, and tomato sauce. Bring to boil. Cover and reduce heat. Let simmer for 15 minutes. To serve, top with cheddar cheese and crushed fritos.